An invasive and usually fatal disease for white-tailed deer has been identified in Connecticut for the first time, state officials report, with more than 50 deer in Portland, Middletown and nearby communities showing symptoms of the virus. 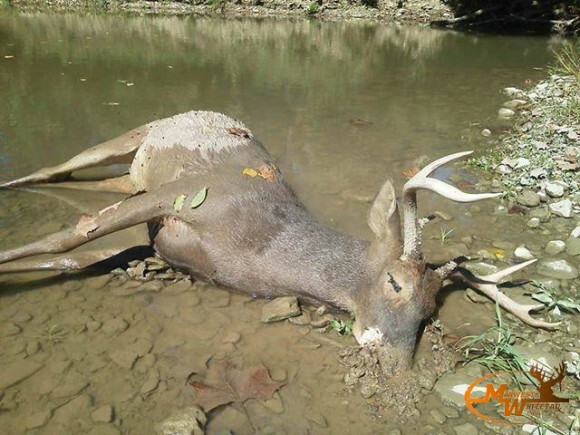 The "Epizootic Hemorrhagic Disease (EHDV-6)" isn't dangerous to humans, but the decomposing bodies of several deer killed by the virus have been found lying along the banks of the Connecticut River since September. "This is the first time we've had a large-scale die-off and confirmation of this hemorrhagic disease in Connecticut," Andy Labonte, a wildlife biologist with the Department of Energy and Environmental Protection, said Wednesday. "This disease kills them pretty quickly," Labonte said, usually within three to five days. A better-known type of hemorrhagic fever is the Ebola virus, which can be deadly for humans. The EHDV-6 virus is transmitted by midges, tiny biting flies, and causes extreme fevers in infected deer, which develop swollen heads, necks, tongues and eyelids, have bloody discharges from their noses, ulcers on tongues, and bleeding in the heart and lungs. In rare instances, this type of hemorrhagic fever has been known to spread to other animals, including elk and domestic cattle. But Labonte said cattle appear to have "a greater resistance" to the virus. Confirmation of the disease in Connecticut came on Oct. 15 when scientists reported that a deer found dead in Middletown had tested positive. Although two other versions of the virus have been known for decades in some states in the southern U.S., the EHDV-6 subtype was first identified in 2006 in Indiana and Illinois. The virus has since spread throughout the Midwest and has been reported in the east from Florida through North Carolina and Maryland. Prior to 2006, the disease was only found in Australia, according to Labonte. He said it's likely the virus came to the U.S. via "human transport, one way or another." "Now that it's here, it will pop up again next year without a doubt," Labonte said. Sick or dead deer have also been reported in Chester, Haddam and Lyme, according to state officials. Outbreaks usually occur in late summer and early fall as the number of midges increases, experts say. The midges carrying the virus die off with the first frost. Labonte said drought conditions in the state may have contributed to the outbreak. He said the lack of rainfall resulted in a drying out of the landscape and the exposure of mudflats where the midges lay their eggs, giving deer browsing along the edges of these muddy areas a greater chance of being bitten by midges carrying the virus. Deer that contract the virus develop severe fevers and seek out water to ease their thirst or to cool off. Labonte said that's why so many of the infected deer was found near or in water. The virus may reduce Connecticut's very large deer population. Some areas in Connecticut are believed to have more than 40 deer per square mile, although some hunters are sceptical of such estimates. "It's going to have some impacts," Labonte said of Connecticut's overall deer population, but he doubts that it will have "a major impact." Connecticut has for decades been dealing with an overpopulation of white-tailed deer. Wildlife experts say too many deer can damage woodland habitats and suburban shrubbery, and contribute to the spread of Lyme disease to people. Labonte said this new type of virus "has had substantial impacts on local deer populations" in other states. "It certainly seems to be the case here in Portland and Middletown," he said. Labonte said residents of those towns who normally see deer on their property are now reporting that "they are seeing zero deer."